This is a wonderful idea, Please Don't give up! Just checking in. How's the project going? It's been a while since I last checked up on this page. Things are getting better every time I check in! I certainly hope this generator come out before the summer, but if it needs more tweaking, take as much time as you need. Once again, I must thank you for all of you hard work, heres a diamond! I've got plenty here in my banana bag. I've been playing the Biome test one for a while and wow,it's fun.The underworld of caves and stuff is epic and it's a smart way to deal with ores.I also like how there is mossy cobble and lightstone there too.The map is beautiful with DokuCraft,especially the high fantasy version. this looks awesome. just a suggestion, would you be able to add like purpose built buildings into a town e.g a big building for the town hall and little huts for houses?? on the bottom left corner it says Created By Dirbaio, just if you cant see it. Where is the program then ? After a big while, development on this program continues! I had lost motivation, and development got stuck. But on the meantime I had many great ideas that could be done, so I finally decided to continue development! The basic engine is nearly finished, supporting multithreading and all. - The heightmap-based ground generation, which places the ground's shape using Stone blocks. - The grass overlay, which puts grass on top of the terrain. Every module has its own configuration options, so you can adapt it to your needs! ALso I found a neat way to simulate erosion in heightmaps, based on this article! The result is great cliffs and canyons as you can see in the following screenshots! Top Left: list of modules in the map. Bottom left: Settings of the selected module. 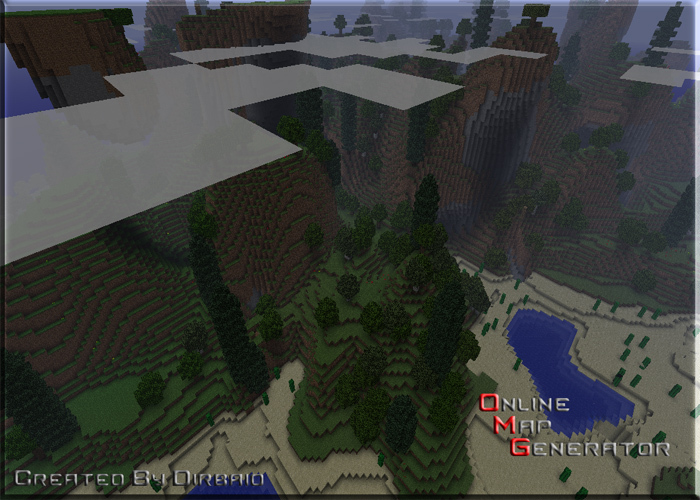 Right: Live preview of the map as you edit it! Some cliffs and a tree that probably hit the wall to hard... or something. The best backyard I've ever had! i have a name idea for the mod! " OMG Map Generator"
An Idea for the name. Protos, it comes from the greek word for first. So it would be Protos OMG. If you can, can you make a map with -7773952433433688808 for the seed on 1.0.0? I saw this map on another post and it looked really cool but it was for 1.0.0.